Scott Tours specialise in wonderful day tours for Tauranga cruise ship passengers. We take visitors on day tours to the fantastic coastal attractions of Tauranga and Mount Maunganui and to the ancient geothermal wonderland of Rotorua. Our tours from Tauranga to Rotorua include experiencing the phenomenon of Wai-o-Tapu tour, as well as Te Puia and Whakarewarewa. We are professional, friendly and New Zealand born guides and operate modern, comfortable air conditioned vehicles. 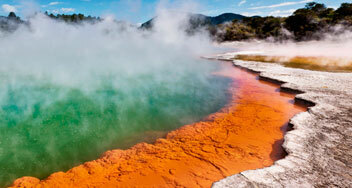 Join our Rotorua tours and Tauranga tours and explore New Zealand’s dynamic culture and diverse landscape. 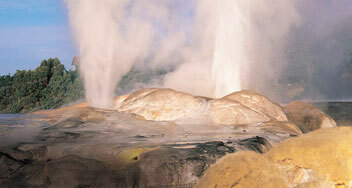 Visit a present day Maori village that is set amongst thermal activity. A stunning geothermal park that will have visitors in awe of Mother Nature. A place to learn about Maori history, song and dance, and arts and crafts. Scott Tours in Tauranga has Qualmark visitor endorsement an assurance that tourism New Zealand, rate us as a trusted tour operator. Relax with Scott Tours. We guarantee you will be back well before your Tauranga cruise ship sailing time at the Port of Tauranga.